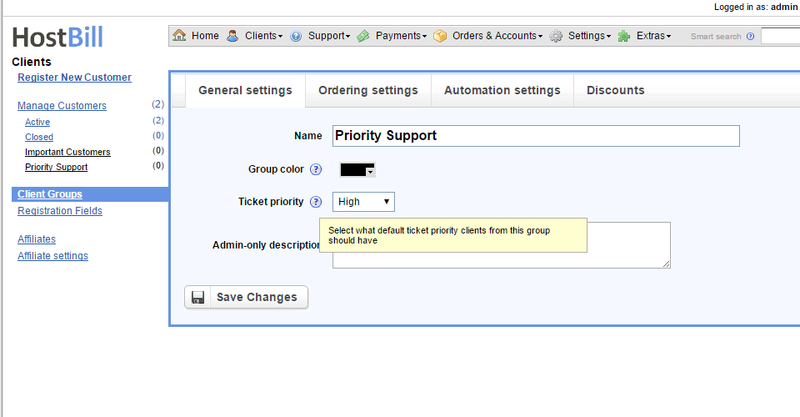 The Priority Support Module allows you to sell priority support as recurring service in automated fashion. Once enabled, Priority Support will create new Client Group: Priority Support. The module will also auto-create Ticket macro and Ticket post-filter. Once client purchases priority support service and pays for it, HostBill will automatically assign client to Priority Support Client Group. Every ticket opened by Priority Client automatically gets high priority, allowing other HostBill functions to react on this event. If related package is suspended (ie. client forgets to pay), client is automatically removed from Priority Support group. Offer your VIP clients the customer service they deserve with Priority Support module for HostBill! 2017-05-24 - Added: Metered billing support with Pre and Post-paid support packages.